Château La Dominique, a St. Emilion Grand Cru Classé property had an illustrious reputation during the 19th century which it has recently reclaimed. The catalyst for its modern renaissance was its purchase by motorway tycoon Clément Fayat in 1969. He installed a brand new cuvier and introduced new techniques in the vineyard. He also engaged the services of the ubiquitous Michel Rolland. 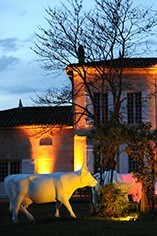 La Dominique is located on the border with the Pomerol appellation and its vineyards adjoin those of Cheval Blanc. The soils are a mixture of limestone, gravel, sand and clay and the 22 hectares of vineyards are planted with Merlot (80%), Cabernet Franc (15%) and Cabernet Sauvignon (5%). The grapes are fermented in temperature-controlled, stainless steel tanks and the wine is then aged in oak barriques (50-60% new) for 18 months. 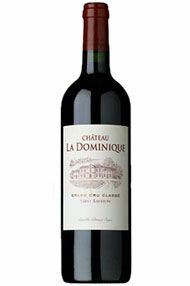 La Dominique produces intense, ultra ripe, and opulent clarets, which, while hard to resist, tend to show at their best with 7-10 years of bottle ageing.